Scientific research tells us that dogs have been around for thousands of years. 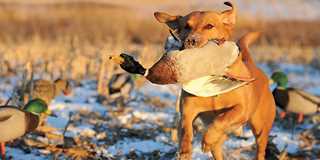 Gun dogs, particularly retrievers now owned by waterfowl hunters, evolved as we know them today over a tiny fraction of that time. Credit our sports-minded forebears for their efforts to establish specific breeds that best fit their hunting needs. Most gun dogs, or sporting dogs if you will, can be traced to the early kennels of European gentry. These aristocrats initially may have taken a hit-or-miss approach, but selective breeding ultimately became the cornerstone of their process. The varied goals of these sporting dog owners created diversity. Some favored upland hunting dogs, some sought partners for the marsh, and others wanted dogs that could do it all. Height, weight, length and color of coat, and other characteristics came to define each specific breed. There are hundreds of recognized dog breeds scattered throughout the world. These purebreds, developed and perpetuated by selective breeding, ideally maintain a closed genetic lineage. The advent of kennel clubs during the 1800s in Europe created specific acceptable standards for each breed. But additional backtracking is required to gain a thorough understanding of canine history. The domestication of the dog began when what must have been the most sociable of wolves began frequenting human encampments. These animals eventually were tamed to a degree and evolved to become guardians of the home front, hunting partners, and participants in other forms of labor, such as herding livestock. From these humble beginnings today's dogs evolved. Humans began pairing dogs for breeding purposes when they recognized two dogs with desirable characteristics. Initially, the goal in most instances was to create dogs suitable for specific functions. For example, short-legged dogs were sought by those who wanted animals capable of wriggling into small holes to catch foxes, badgers, or rodents. Other dogs were bred to be large, formidable beasts to serve as sentries and protect their owners from intruders. Sport hunting throughout Europe and later in North America spurred increased interest in the development of the gun dogs that we recognize today. Kennel clubs have defined breed standards, but these qualities were the product of considerable tinkering by those who treasured days in the uplands or in the marsh. Retrievers, pointers, and setters evolved with specific attributes linked to desired overall performance afield. Early gun dog breeders certainly did not fall into one unwavering line behind a single type. If they had, only a fraction of the breeds now in existence would have emerged. Instead, these pioneers mixed and matched and paired up sires and dams with the hopes of creating something special. Sometimes these efforts produced the desired results. Sometimes they did not. What may come as a surprise to some retriever enthusiasts is the fact that the standard poodle, which originated in Germany, ranks as one of the oldest sporting dog breeds in the world. Poodles, which are both intelligent and strong swimmers, were sometimes referred to as "rough water dogs." These animals are a far cry from the miniature and toy versions that were later developed in France as pets. The French, however, were well aware of this breed's background. Poodles were called caniche in France, which translates to "duck dog." Poodles arrived in the United States late in the 19th century. A number of early sporting dog enthusiasts employed hounds in their breeding stock, likely because of their scenting ability. 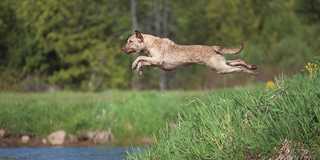 Other dogs were selected for their size, type of coat, agility, athleticism, intelligence, health, temperament, and in some cases, their affinity for water work. The St. John's water dog, for example, was originally bred by fishermen to retrieve codfish in the frigid waters off the coast of Newfoundland. There is considerable conjecture among historians about the types of dogs that were used to produce today's breeds. Some breeds have substantial documentation, while others are open to questions that may never be answered. During the 1700s and 1800s, more than 50 gun dog breeds were developed. Some remain popular today, while others are now extinct. Consider the springer spaniel. At one time, these dogs were separated by size. The smaller versions were referred to as "cockers," as in cocker spaniel. The larger varieties were called "springers." It was not until the late 1800s that these breeds were completely separated and a ban on interbreeding was imposed. Then there is the flat-coated retriever, whose ancestry includes a mix of wavy-coated retrievers, water spaniels, St. John's water dogs, setters, and perhaps collies. A look at the Irish water spaniel's heritage includes breeding crosses involving poodles, old Spanish pointers, Portuguese water spaniels, and Irish setters—a perfect example of genetic alphabet soup. The United States made a significant contribution to the overall diversity of sporting breeds. 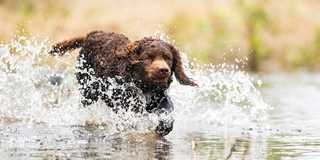 These include the American water spaniel, which was refined during the 1920s in Wisconsin's Wolf and Fox River Valley regions by gunners who wanted a smaller, yet tough water dog that could be easily transported in duck skiffs and canoes. The Boykin spaniel, used as a retriever and for turkey hunting, is a product of South Carolina, where, again, the breeders sought a more diminutive type of gun dog in the early 1900s. On the other end of the size spectrum, waterfowlers in the Chesapeake Bay region yearned for a duck dog that could withstand the demands of big-water gunning in the worst conditions. Enter the Chesapeake Bay retriever, the hardiest of all gun dogs and the first retriever to be recognized by the American Kennel Club—in 1878—decades ahead of any other retriever breed. Bred for the singular purpose of retrieving waterfowl, the Chessie, which was developed in Maryland, was also once known as the Chesapeake Bay ducking dog, for good reason. The golden retriever and Labrador retriever rank as the most popular breeds among today's waterfowlers. In addition to being accomplished hunters, Labs and goldens make fine companions and family dogs. Indeed, these breeds consistently rank in the top 10 annually in terms of American Kennel Club registration, with the Lab being the most popular dog in the nation for the past 27 years. Two major players contributed to the development of the venerable Lab. They include the fifth Duke of Buccleuch, who established a Labrador kennel during the 1830s in Scotland, and the second Earl of Malmesbury, who lived in southern England and established a breeding program in the early 1800s. The foundation of both kennels were St. John's water dogs. A relative latecomer to this country, the first Labrador retriever was registered with the American Kennel Club in 1917. The leading figure in the development of the golden retriever was Sir Dudley Marjoribanks, later Lord Tweedmouth, who maintained detailed records of his breeding program. Developed in Scotland during the mid-1800s, the golden's ancestors were a mix of wavy-coated retrievers, Tweed water spaniels, setters, and bloodhounds. The golden retriever was first recognized by the American Kennel Club as a registered breed in 1925. Each retriever breed has its own strengths and weaknesses. One person's favorite may place last on another person's list. And that's okay, but one should hold all approbation or ridicule of any kind of retriever until one either owns a member of that breed or otherwise becomes personally familiar with it. Do not believe everything you are told about any given breed. All in all, regardless of one's favorite retriever, considerable credit should be accorded to our sporting ancestors. They, too, valued the grace, companionship, and performance delivered regularly by our canine partners. In respect to the waterfowling tradition, retrievers are at the very top of the list. During his long and distinguished career with DU magazine, the late Gary Koehler was among our most popular and prolific contributors. We are honored to share this previously unpublished story with our readers. Ever wonder where your dog's social nature came from? The answer is quite simple: the wolf. Researchers have long studied fossils and other evidentiary remains to get a better understanding of the dog's earliest ancestors. 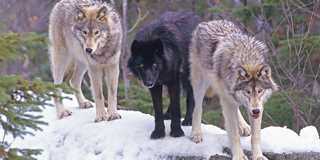 Many species are now extinct, but the wolf has survived by adapting to a changing environment. Our dogs' wild ancestors evolved within a social structure—the pack—and developed close relationships with other members of their kind, perhaps due to the necessity of bringing down larger animals for prey. Physically, many dog breeds retain traits common to wolves, including outstanding hearing, sturdy limbs, scent marking, compact feet, teeth that can catch and hold prey, and an insulating coat. Today's dogs have any number of distant relatives, but the wolf is the root of the family tree. In fact, dogs share 99.8 percent of their DNA with Canis lupus. The majority of today's gun dogs, including retrievers, can trace their heritage to the work of European breeders, although waterfowlers in North America produced some of the world's most specialized retriever breeds. Yesteryear's sportsmen and women went to great lengths to develop breeds to best match their in-the-field needs. Spaniels had their place, as did setters, pointers, and retrievers. Some individuals sought to produce do-it-all breeds adaptable to all field situations. Here is a short list of where many of the recognized gun dog breeds originated.